M Ahmad, S Shah, T Xie, M McCulloch, A Chamoun, H Nguyen, B Uretsky. Real Time 3D Echocardiography Before and After Percutaneous Mitral Balloon Valvuloplasty. The Internet Journal of Cardiology. 2001 Volume 1 Number 2. A 43 year old Latin American female underwent percutaneous mitral balloon valvuloplasty (PMV). The patient was evaluated by conventional 2D echocardiography and by Real time 3D echocardiography with real time volume rendering (RT-3D RTVR), before and after PMV. The utility of RT-3D RTVR in evaluating patients for PMV and its advantages over 2D are illustrated in this presentation. RT-3D RTVR is a new imaging technique with rapid acquisition (1-2). The technique offers multiple simultaneous views with precise alignment of image planes for accurate measurement of mitral valve area (MVA) from the apical window (3). Since assessment of MVA post PMV is complicated by a number of hemodynamic changes, we applied RT-3D RTVR in assessment of mitral valve before and after PMV (4). 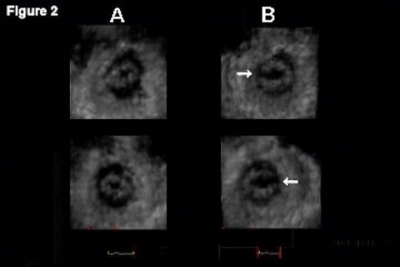 A 43-year-old Latin American female with rheumatic mitral stenosis was referred for PMV. 2D echo revealed a left ventricular ejection fraction of 55-60%, mean gradient across the mitral valve of 20 mmHg, and MVA of 0.8 cm 2 by pressure half time and by planimetry. Mild mitral regurgitation was present and the Wilkins' score was 7. In addition, mild tricuspid regurgitation with a peak velocity of 3.8 m/s (estimated pulmonary artery systolic pressure of 70 mmHg) was noted. Using real-time 3D with real-time volume rendering (RT-3D RTVR), MVA was 0.8 cm 2 and the Wilkins' score was 7. RT-3D cine loops: simultaneous RT-3D orthogonal 4-chamber, 2-chamber and RTVR C-scan views are shown sequentially before and after PMV. The image plane (yellow) is steered in the orthogonal views to obtain the RTVR C-scans of the mitral valve from the ventricular and the atrial sides. Post PMV images show the split in medial commissure with an increase in the valve area. Cardiac catheterization showed normal coronaries, a mean mitral gradient of 15 mmHg and MVA of 0.6 cm 2 (Gorlin formula). Post PMV, mean mitral gradient decreased to 8.2 mmHg. MVA was not calculated due to the development of moderate mitral regurgitation. 2D echo measured a mean mitral gradient of 10 mmHg and mitral valve area by short axis planimetry of 1.2 cm 2 . Moderate mitral regurgitation was noted. RT-3D RTVR demonstrated the medial commissure had been split post PMV and, after careful alignment of the imaging planes, the measured MVA was 1.4 cm 2 (Figures1 and 2). Figure 1. RT-3D apical four chamber (4C) and two chamber (2C) orthogonal views with imaging planes above and below the mitral level. 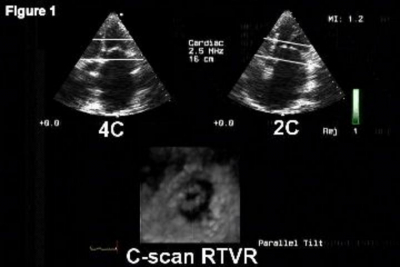 Real time volume rendered (RTVR) C-scan with a ventricular view of the mitral valve in the bottom panel. Figure 2. RT-3D RTVR C-scan images before (A) and after PMV (B) with ventricular views (top) and atrial views (bottom). Arrows point to the split in the medial commissure after PMV. PMV may result in changes in cardiac output, atrial shunting and development of mitral regurgitation, all of which complicate the calculation of MVA by cardiac catheterization using Gorlin formula (5). The Doppler-derived MVA after PMV is inaccurate due to changes in the left atrial compliance (4). Measurement of MVA by planimetry in 2D echo short axis views has been proposed as the gold standard post PMV(5). However, the technique requires high-quality parasternal images and precise image plane alignment to display the true mitral orifice. These technical details may be difficult to achieve post PMV due to the changes in the geometric shape of the mitral orifice. RT-3D with RTVR employs a matrix array probe with instant acquisition of mitral valve images from the apical window(1,2). Image plane can be tilted and precisely aligned to detect mitral orifice(3). Multiple views can be obtained from the atrial and the ventricular sides of the mitral valve (Figure 2). The case described above illustrates the use of RT-3D RTVR in PMV. RT-3D RTVR provided unique new views, accurate measurements, and demonstrated the anatomic basis for the increase in mitral valve area and for the development of mitral regurgitation. RT-3D RTVR is a new method with the potential of more accurately evaluating patients before and after PMV. 4. Thomas JD, Wilkins G, Choong, CY, Abascal, VM, Palacios, IF, Block PC, Weyman, AE (1988) Inaccuracy of the Mitral Half -Time Immediately After Percutaneous Mitral Valvotomy: Dependence of Transmitral Gradient on Left Atrial and Ventricular Compliance. Circulation 78:980-993.